Karl Friedrich Abel (1723-1787), Composer and concert impresario. Sitter in 5 portraits. 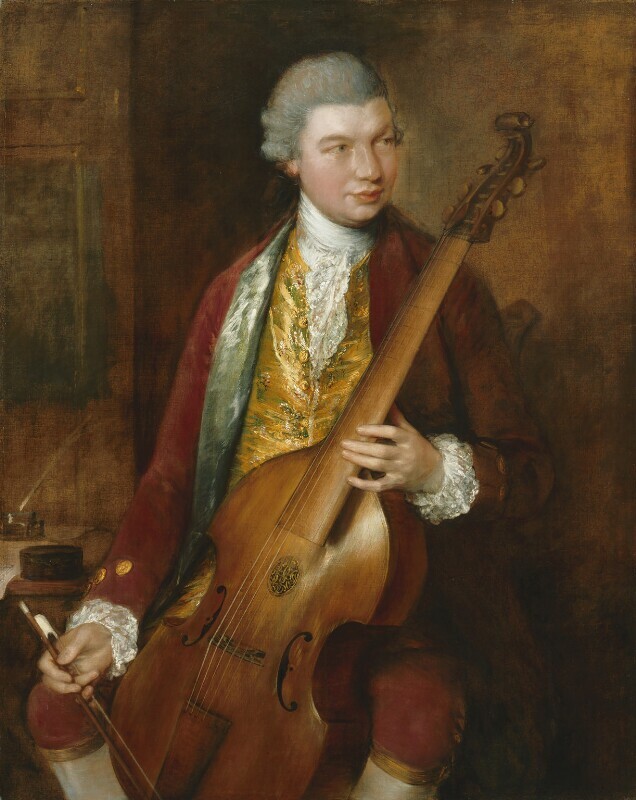 Abel and Gainsborough were close friends who shared a passion for the viola da gamba and a love of life. Gainsborough became a skilful performer on the instrument and his careful portrayal of the underhand grip of the bow in this portrait reflects his understanding. In return for his teaching Abel received some paintings and many drawings by his friend. On Abel's death Gainsborough said, 'I shall never cease looking up to heaven the little while I have to stay behind - in hopes of getting one more glance of the man I loved from the moment I heard him touch the string'. George Grenville is dismissed as Prime Minister. He is succeeded by Charles Watson-Wentworth, 2nd Marquess of Rockingham. Isle of Man is brought under British control. Stamp Act requires that printed materials in the colonies, such as legal documents and newspapers, are produced on paper made in London carrying an embossed revenue stamp. Nevil Maskelyne becomes Astronomer Royal. Writer Samuel Johnson publishes his edition of Shakespeare. Inventor James Watt makes a breakthrough in the development of the steam engine by constructing a model with a separate condenser. Judge and politician William Blackstone publishes his influential work Commentaries on the Laws of England. Robert Clive secures the rights for the East India Company to collect taxes in Bengal from Mughal Emperor Shah Alam. American campaigners against the Stamp Act organise themselves as the Sons of Liberty in Massachusetts and New York.